JWB Manufacturing, LLC. – The World's Best Blades. Period. JWB Manufacturing offers the best stripping blades for all original equipment manufacturers (OEMs) in the industry. "If you haven’t tried our products and services yet, we hope to earn your long-term trust and demonstrate our commitment to your success. We’re confident you’ll find our selection, pricing and service exemplify the highest standards of quality and customer care in the industry." 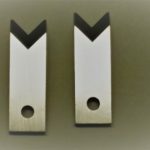 Our aim is to create precise, expertly made wire cutting and stripping blade styles for all of the major original equipment manufacturers including Schleuniger , Komax, Eubanks, Artos, Megomat, AMP, Toyojamco, Carpenter, AM.STRIP & Ideal and others. We also create custom blades to order. Our other services include machining, grinding, mold making and repair.